I’ve been doing a week of vegan eating with my friend and newly certified Holistic Health Coach – Danielle Bertiger’s Uncaged Cuisine Cleanup! It’s really opened my eyes to vegan eating and how purely GREAT all natural food can be! Check out the link for more info on her and what she’s up to. The cleanup is a great place to start, and she has some recipes that are the bomb.com. Danielle is not a chocolate lover (weird, right?!) 🙂 so I had to venture out on my own into the world of vegan chocolate land. I went there, and it is a beautiful land, I must say! I wasn’t in the least bit disappointed. I shared these babies with a few friends, and they might be as obsessed as I am with these things! So, vegan or not, you should make these and astound your family and friends at how black beans can be so wonderful! 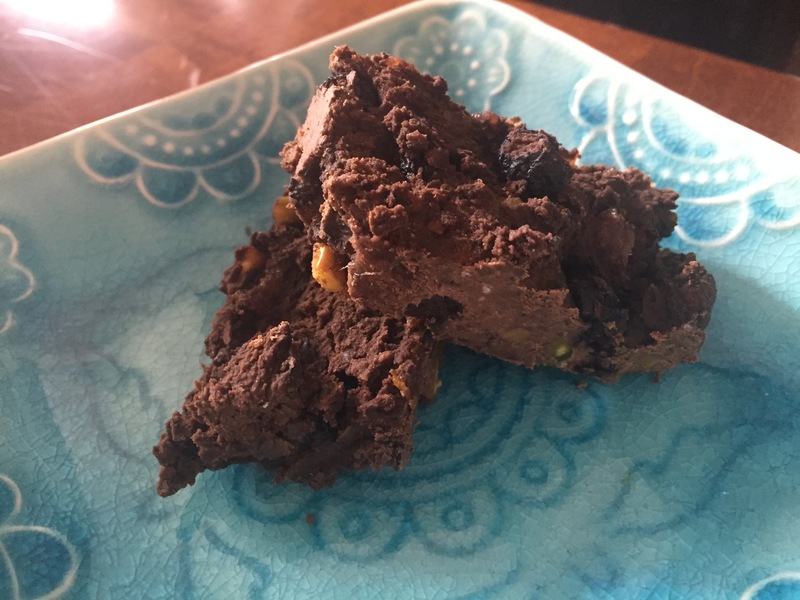 I adapted this recipe to use no sweeteners and added in a few things from Chocolate Covered Katie’s blog! Pour into a greased 8×8 square pan. Cook the homemade chocolate protein bars 16 minutes. They will still look underdone when you take them from the oven, but this is okay. You may want to taste them out of the oven – they are very brownie-esque, and good! To make these into chilled bars – refrigerate overnight. The bars will have firmed up and are now ready to cut and eat. Store leftovers in the refrigerator. Makes about 10 bars.